The photo’s title is “December”. 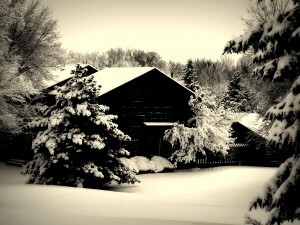 The photo was taken in North Saint Paul, MN and is a picture of townhouses where I used to live. I enjoy the warmth the image brings, giving a comfort similar to drinking hot chocolate before a fireplace. I wanted to capture this feeling and bring it home with a sepia tone. 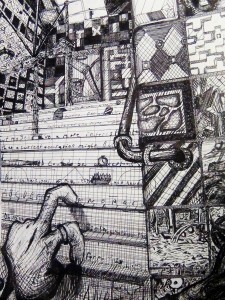 The drawing is titled “The Staircase”. As an abstract piece, my mind found a metaphor of the dizzying aspects the climb of life revolves around and bring it into an eerie and distracting sense. This is based off of a corner of my high school’s staircase, with some images based on childhood ideologies, things, and memories. One tile has a playground in it. Another is a carpet I used to hop about as though the gray blobs were stones in a river. The writing on the staircase depicts my train of thought, which often trails and wanders without my consent. This foreign place may be deemed unfriendly to newcomers. Taking a step back and realizing the details as individuals brings light to the fog of mysteriousness. Painted with pen and ink on paper. Daniel Marquez is a philosophical student at North Saint Paul Senior High School in Saint Paul, Minnesota who has a knack for creativity no matter the medium. From writing, to art, to baking, he strives to accomplish a wholehearted life.